The United States Army has been actively looking for a replacement for the iconic Humvee, resulting in Russia coming up with its own new multi-purpose military vehicle. Russia’s biggest manufacturer of trucks and heavy machinery, ZIL, unveiled a concept called ZIL Army Car, which is lightweight and features big tires, huge axles, and a neat outer shell. 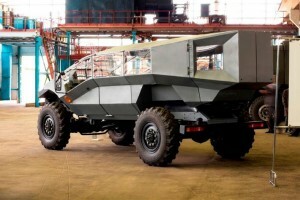 The ZIL military vehicle is capable of carrying 10 people with gear and can easily cruise over a wide variety of terrain thanks to a four-cylinder diesel engine. The US Army is still vetting different multi-purpose military vehicle designs, but it will be interesting to see what concept the United States will eventually choose to rival Russia’s new ZIL military vehicle.